PHS is essentially a cordless telephone like DECT, with the capability to handover from one cell to another. PHS cells are small, with transmission power of base station a maximum of 500 mW and range typically measures in tens or at most hundreds of metres (some can range up to about 2 kilometres in line-of-sight), contrary to the multi-kilometre ranges of CDMA and GSM. This makes PHS suitable for dense urban areas, but impractical for rural areas, and the small cell size also makes it difficult if not impossible to make calls from rapidly moving vehicles. PHS uses TDMA/TDD for its radio channel access method, and 32 kbit/s ADPCM for its voice codec. Modern PHS phone can also support many value-added services such as high speed wireless data/Internet connection (64 kbit/s and higher), WWW access, e-mailing, and text messaging. PHS technology is also a popular option for providing a wireless local loop, where it is used for bridging the "last mile" gap between the POTS network and the subscriber's home. It was developed under the concept of providing a wireless front-end of an ISDN network. Thus a PHS base station is compatible with ISDN and is often connected directly to ISDN telephone exchange equipment e.g. a digital switch. In spite of its low-cost base station, micro-cellular system and "Dynamic Cell Assignment" system, PHS offers higher number-of-digits frequency use efficiency with lower cost (throughput per area basis), compared with typical 3G cellular telephone systems. It enables flat-rate wireless service such as AIR-EDGE, throughout Japan. The speed of an AIR-EDGE data connection is accelerated by combining lines, each of which basically is 32 kbit/s. The first version of AIR-EDGE, introduced in 2001, provided 32 kbit/s service. In 2002, 128 kbit/s service (AIR-EDGE 4×) started and in 2005, 256 kbit/s (8×) service started. In 2006, the speed of each line was also upgraded to 1.6 times with the introduction of "W-OAM" technology. The speed of AIR-EDGE 8× is up to 402 kbit/s with the latest "W-OAM" capable instrument. In April 2007, "W-OAM typeG" was introduced allowing data speeds of 512 kbit/s for AIR-EDGE 8x users. Furthermore, the "W-OAM typeG" 8× service was planned to be upgraded to a maximum throughput of 800 kbit/s, when the upgrading for access points (mainly switching lines from ISDN to fibre optic) in its system are completed. Thus it was expected to exceed the speeds of popular W-CDMA 3G service like NTT DoCoMo's FOMA in Japan. Developed by NTT Laboratory in Japan in 1989 and far simpler to implement and deploy than competing systems like PDC or GSM, the commercial services were started by three PHS operators (NTT-Personal, DDI-Pocket, and ASTEL) in Japan in 1995, forming the PIAF (PHS Internet Access Forum). However, the service was pejoratively dubbed as the "poor man's cellular", due to its limited range and roaming abilities. Market share in Japan has been declining and NTT DoCoMo, which has absorbed NTT Personal, and ASTEL terminated the PHS service in January 2008. Most other countries with PHS networks have also terminated offering PHS services and migrated to GSM. In Thailand, TelecomAsia (now True Corporation) integrated the PHS system with Intelligent Network and marketed the service as Personal Communication Telephone (PCT). The integrated system was the world's first that allowed the fixed line telephone subscribers of the public switched telephone network to use PHS as a value added service with the same telephone number and shared the same voice mailbox. The PCT service was commercially launched in November 1999 with the peak of 670,000 subscribers in 2001. However, the number of subscribers had declined to 470,000 in 2005 before the breakeven in 2006 after six years of heavy investment up to 15 billion THB. 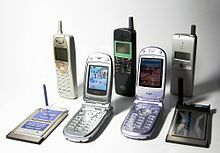 With the popularity of other cellular phone services, the company shifted the focus of the PCT to a niche market segment of youths ages 10-18. Wireless local loop (WLL) systems based on PHS technology are in use in some of the above-mentioned countries. WILLCOM, formerly DDI-Pocket, introduced flat-rate wireless network and flat-rate calling in Japan, which reversed the local fate of PHS up to an extent. In China, there was an explosive expansion of subscribers until around 2005. In Chile, Telefónica del Sur launched a PHS-based telephony service in some cities of the southern part of the country in March 2006. In Brazil, Suporte Tecnologia has a PHS-based telephony service in Betim, state of Minas Gerais, and Transit Telecom announced a rollout of a PHS network in 2007. China Telecom operated a PAS system in China, although technically it was not regarded as allowed to provide mobile services, because of some particularities of the Chinese governance. China Netcom, the other fixed-line operator in China, also provides Xiaolingtong service. The system was a runaway hit, with over 90 million subscribers signed up as of 2007[update]; the largest equipment vendors were UTStarcom and ZTE. However, low priced mobile phones rapidly replaced PHS. The Ministry of Industry and Information Technology of the People's Republic of China issued notices on 13 February 2009 that both registration of new users and expansion of the network were to be discontinued, with the service to be ended by the end of 2011. A PHS global roaming service was available between Japan (WILLCOM), Taiwan, and Thailand. Willcom merged with eAccess into Y!mobile in 2014. Operated by Carlyle (Willcom) (2004–2010). Operated by KDDI (DDI Pocket) (1995–2004). 070 prefix under the Japanese telephone numbering plan. ^ Calvert, John (16 May 2003). Network Services: Thailand. Gartner. Retrieved 17 February 2019. ^ a b Report Form 56-1 For the Year 2001 TelecomAsia Corporation Public Company Limited (PDF). 2001. pp. 15, 22. Retrieved 19 February 2019. ^ "Excel switches to be deployed in major telecom installation in Thailand". Excel, Inc. Press Release. 30 May 1997. Retrieved 19 February 2019. ^ "True's WE PCT to finally break even". TeleGeography. 23 Mar 2006. Retrieved 17 February 2019. ^ MIIT Ceases PHS Registration, Network Expansion. ^ "PHS Guidebook (4th Edition)" (PDF). PHS MoU Group. 2008-09-29. Archived from the original (PDF) on 2016-02-04. Retrieved 2016-01-29. ^ a b "Japan permit Frequency and class of emissions" (PDF). SGS RF Technologies. 2015-10-22. Retrieved 2016-01-29. ^ "Carlyle and Kyocera agree deal for DDI Pocket". TeleGeography. 2004-06-22. Retrieved 2016-01-29. ^ "Willcom to launch high speed PHS". TeleGeography. 2005-06-21. Retrieved 2016-01-29. ^ "Adaptix tests Japanese PHS upgrade". TeleGeography. 2006-07-19. Retrieved 2016-01-29. ^ "Carlyle to increase Willcom stake, paper says". TeleGeography. 2009-03-16. Retrieved 2016-01-29. ^ "Softbank named as possible bidder for Carlyle's struggling Willcom unit". TeleGeography. 2009-11-27. Retrieved 2016-01-29. ^ "PHS provider Willcom to be split; investors to provide financial aid". TeleGeography. 2010-03-12. Retrieved 2016-01-29. ^ "Softbank to buy 100% of PHS operator Willcom". TeleGeography. 2010-10-15. Retrieved 2016-01-29. ^ "eAccess and Willcom merge under the Ymobile banner". TeleGeography. 2014-06-02. Retrieved 2016-01-29. ^ "MNP service for PHS subscribers in Japan from 1 October". TeleGeography. 2014-09-30. Retrieved 2016-01-29. ^ "SoftBank announces PHS switch-off in July 2020". TeleGeography. 2018-04-20. Retrieved 2018-04-20. ^ Other radio communication equipment permitted by NTC (PDF). Telecommunication Engineering and Technology Bureau. January 2011. Retrieved 17 February 2019. ^ Thailand (PDF). ITU-D Study Groups. p. 15. Retrieved 17 February 2019. ^ "PHS networks to make way for TD-SCDMA". TeleGeography. 2009-02-04. Retrieved 2016-01-29. ^ "Unicom to shut down PHS service". TeleGeography. 2013-07-25. Retrieved 2016-01-29. ^ "OFTA proposes refarming PHS 1900MHz frequencies for mobile data services". TeleGeography. 2011-11-25. Retrieved 2013-07-05. ^ "No more PHS services, concludes OFTA". TeleGeography. 2012-03-02. Retrieved 2016-01-29. ^ "OFCA begins PHS shut down". TeleGeography. 2013-04-23. Retrieved 2016-01-29. ^ "Hong Kong waves goodbye to PHS". PolicyTracker. 2016-05-05. Retrieved 2016-12-31. ^ "DoCoMo to scale back PHS operations and focus on 3G". TeleGeography. 2003-09-12. Retrieved 2016-01-29. ^ "No more PHS for DoCoMo". TeleGeography. 2005-02-18. Retrieved 2016-01-29. ^ "DoCoMo to unveil HSDPA handsets; shut down PHS network in 2007". TeleGeography. 2006-02-01. Retrieved 2016-01-29. ^ "DoCoMo to shut down PHS services next year". TeleGeography. 2007-04-30. Retrieved 2016-01-29. ^ "DoCoMo to exit PHS following drop in subscribers". TeleGeography. 2008-01-07. Retrieved 2016-01-29. ^ "Spectrum Planning Progress in Taiwan" (PDF). National Communications Commission (NCC). 2014-10-30. Retrieved 2016-02-03. ^ "Fitel looking to boost sales of dual technology PHS-GSM handsets". TeleGeography. 2005-11-15. Retrieved 2016-01-29. ^ "Fitel planning to upgrade PHS infrastructure". TeleGeography. 2013-02-11. Retrieved 2016-01-29. ^ "Fitel's PHS coverage shrinks as its switches off base stations to reduce costs". TeleGeography. 2014-04-22. Retrieved 2016-01-29. ^ "Bankrupt Fitel facing licence cancellation as NCC outlines plans to reassign numbers". TeleGeography. 2015-01-05. Retrieved 2016-01-29. ^ "Fitel numbers to be reassigned to existing operators". TeleGeography. 2015-05-05. Retrieved 2016-01-29. ^ "Telsur lanza PHS en plataforma de UTStarcom" (in Spanish). Business News Americas. 2006-03-23. Retrieved 2017-04-16. ^ "Telefónica del Sur lanza al mercado teléfono dual único en Latinoamérica" (in Spanish). El Mercurio. 2008-11-08. Retrieved 2017-04-16. ^ "20 millones de dólares a la basura: Telefónica del Sur dejó de comercializar el "superinalámbrico"" (in Spanish). La Opinion. 2011-05-17. Retrieved 2017-04-16. Wikimedia Commons has media related to PHS. PHS MoU Group (PHS MoU was dissolved and absorbed into a new organization "XGP Forum" in 2009.